…connect the mask to the tubing and CPAP machine. Once all the connections are made, turn the device on. Most often, the device starts at a lowered setting and gradually increases the air pressure (this is called Ramp) the longer you use it. This allows you to fall asleep easily, but it will also help you to practice with it. 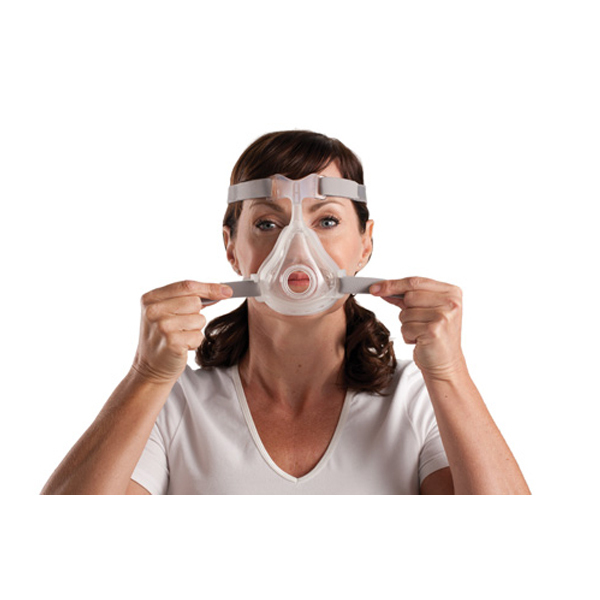 During the beginning of your effort with the CPAP mask and machine, take slow and deep breaths with the mask and pressure blowing. You will find that the air pressure fills up your lungs, which is easy to breathe in. As you breathe out you will feel a little resistance. You will hear the air escaping from the exhalation ports on the mask, which are on the front panel of most, if not all masks This resistance is a little uncomfortable, however keep at it: it will get easier. Try to focus on taking full, even breaths. Keep your mouth closed as you do this. especially for masks that fit slightly up or around the nose. Be mindful that if you open your mouth with a nasal oriented mask, you will feel the air rush out (following the path of least resistance) and there will be no CPAP benefit. Once you establish a comfortable breathing pattern, perhaps after a few minutes or hours, focus your attention on something pleasant and do something you enjoy: watch a little television or a movie, read a book or magazine, listen to some music, or get on the Internet. The next step will make this adaptation process to CPAP easier. Thank u, great sharing!! I have recently been diagnosed. I am new user with this machine really struggling with cpap. Get Into CPAP Trials Today and Sleep Better Tonight!